What’s With All These Skunks? 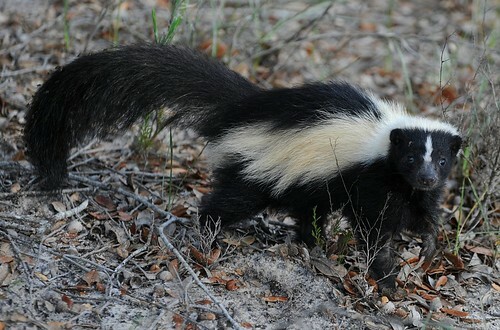 Earlier this year, I saw people on my Twitter timeline discussing skunks and I thought to myself, “How am I the only one who’s never seen one before?” They’re pretty common in the Midwest and people usually seem shocked when I share that tidbit of info with them. So imagine my surprise when, a month ago, I’m sitting on the porch at dusk (by myself, thankfully) and see a skunk just strolling down the sidewalk, like it’s a completely normal thing. At first glance I just thought it was a random neighborhood cat. We have a lot of outdoor cats that wander around our subdivision. But I did a double take and saw that it was a skunk! I shot in the house to tell everyone! I was so excited I left my magazine and drink outside for the night. Oops! Fast forward another 2 weeks and I would have another skunk sighting, but this one wouldn’t be so harmless. The Puddles Chronicles: That Darn Neighbor Cat! People always talk about how territorial dogs are. They need to be discussing that character trait in cats! Our neighbor cats are constantly coming in our yard and strutting in front of our windows; knowing one of our cats, Puddles, is an indoor cat (unless she has supervision). I was actually able to catch a bit of this exchange on my iPhone and it’s very funny! Enjoy! If you followed my tweets earlier, you know that my two cats, Puddles and Gracie, had their yearly appointment with the vet today. If you have cats, you’re probably thinking, “yea, so what’s the big deal? We do that every year too.” Well, if it’s not a stressful event for you, consider yourself lucky. Because in my household, we need to create a military style plan to get our cats to the vet! It’s not pretty! The cats know when they have to go to the vet. We must release some pheromones or something that tips them off because they scatter. We have to close all the doors upstairs and corner them in one room. Then Puddles starts howling as if you’re trying to kill her. My mom has to put on these ridiculously thick gloves because Puddles’ claws will be coming out to attack. And I have to stand in the doorway and act as a block to stop her, if she gets away from my mom. One time, she ran towards and knocked me over. No lie! Something was different today, though. Puddles had no clue it was “vet day”. She was strutting around as usual, begging to be pet, and taken outside. Just another day. We’ve tried the outside thing before and she always knew what was coming, so never came outside. Not today! She came right on out! My mom put on her gloves and opened the hatch of her car. Before Puddles knew what hit her, she was in the car! Success! Gracie is always easy. She tries to hide, but isn’t very good at it. So, we can just pick her up and put her in the car.